MDC T UK NON SHONA SPEAKERS, DISSAPPOINTED BY Nelson Chamisa, for addressing multilingual Zimbabweans in Bedford Britain, in Shona only. One Zola Ncube said on Facebook: “I really don’t understand how some educated politicians who have so many degrees to their name can address people in Shona or any language thats not understood by the majority or the minority even. “What does it take to arrange an interpreter. UChamisa comes all the way to the UK, to address people in Shona, what about those speakers of other languages who attended the rally. 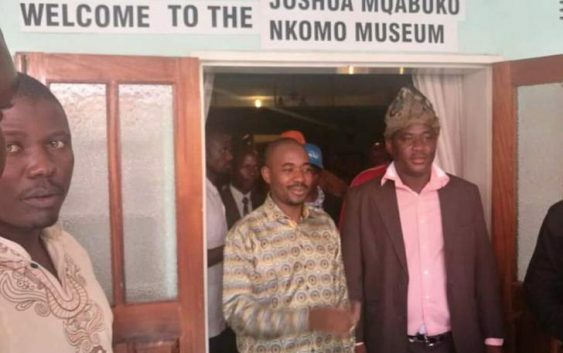 Many Ndebele people are upset that Chamisa won’t address in English or use a translator. It’s not because he doesn’t want to do this. Chamisa won’t be able to address a full rally in English and maintain his charisma that’s made him popular so far. Chamisa was born in Masvingo and had a D in O level English language. He had to take it twice to attain a C grade in O’ level and that is why he started going to college at Harare Polytechnic. I spoke to someone with information on how Chamisa struggled with English and didn’t want to be identified. Chamisa is choppy in English because he speaks from the head without a prepared speech. That style will not work for him if he speaks in English. A speech therapist and speech, Josephine Mangwana who works in London coaching many African businessmen on how to read and speak in public stresses that Ndebele people be forgiving on Chamisa’s reluctance to use an interpreter either. He has to flow in his disjointed speech techniques which uses a lot of shouting and doesn’t follow the last word introduced. He is the worst speaker whose managed to fool many with confidence when he speaks. He gets an A on confidence and delivery of sound bites that are usually disjointed and it does work for a rally where a lot of noise and control of the crowd is captivated by his stage presence. All eyes are on his movements. His style is the what we call the choir conductor. Not for a song but of the noise, the cheers and the drums of the rally. It’s a fun-fare filled with psychological zingers, irrelevant jokes and posture. If he changes his style, it will expose him to more mistakes and will show emptiness to his gallery rhetorics. Sorry folks. He’s just not cut to address in English. Chamisa must start using a prepared speech like Mugabe. Read from a paper on a podium. He has the voice and gestures. He will survive if he does that. But he won’t have the whole stage to walk around and use his illusion and magical trick like Harry Houdini. When in UK, he was on a table and felt restricted from achieving a stellar performance and hence he too blamed the rally organizers as ill-prepared. It’s because he expected a wide stage to pace around and perform his tricks to those who want to glue their eyes on him. ED is a better speaker in English than Chamisa. He can complete the thought of the sentence without erratically jumping to the beginning of the sentence. He flows and he sounds stable, composed and seasoned. Side, by side in a debate, Chamisa could lose to ED when scoring points. One rally by Chamisa, you would have seen them all and will feel like the same movie over and over again. His style won’t last long. If he speaks in English, he will also sound more like a UZ Student at the Student union building. Choppy and meaningless large words with little content. Sorry folks. It’s not personal. It’s the Style. ‘MORE POLICE DEPLOYED IN BLOODY LONDON MAY BANK HOLIDAY AFTER FOUR PEOPLE ARE SHOT -.So far, 62 people have been murdered in London’s streets already in 2018’.